Madam Veronica Uloko, a 132 -year-old super-centenarian from Iyamho community, Etsako clan, Edo State, the hometown of the outgoing Governor of Edo State, Comrade Adams Oshiomhole, has uncovered the secret of the governor’s uncommon boldness and power. Curiously, Madam Uloko, who is blind and can no longer walk, wants God to take her life because of the agony she was undergoing over the loss of three of her seven children, especially the 73-year-old son that died in August, this year. She spoke to Niger Delta Voice, NDV, at Iyamho through her 71-year-old son, Obanor, who served as interpreter during the interview. Officially, by the Guinness World Records, the oldest living person in the world is 116-year-old Italian, Emman Morano of Verbani in Italy. 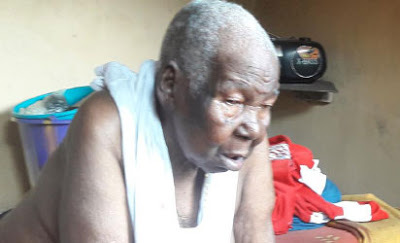 Obanor, her son, who said his elder sister is 84 years old, informed us that the death of his elder brother affected the health of their mother, who does not want to live while her children die. True to her words, outgoing Governor Oshiomhole, indeed, served the state with exceptional heroism and prudence, mouthing it all the time that he was not a coward and would not be bullied by anybody. He boasted that he uprooted what he described as entrenched political godfathers in the state because God did not give him spirit of cowardice. Madam Uloko, who is excited by Oshimohole’s developmental strides in the state, said: “We are happy that only one man came to rescue us, not only our people, the entire Edo north and Edo state. “I pray that Oshiomhole will get another big appointment when he leaves as governor. I thank Oshiomhole for what he has done for our people, when you come to our village, Iyamho; you will not recognize the place again, as people continue to tell me because I can no longer see. I have prayed for him and I will continue to pray for him because he made our people proud,” she added.